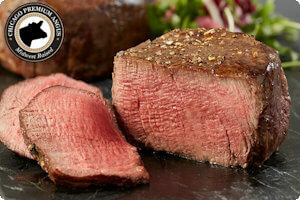 The tenderloin is the most velvety, tender part of the steak and it is called a Filet Mignon. These six 6 oz. Filets Mignons are hand-cut and individually scrutinized for color, texture, and marbling. They are then slowly wet-aged for 4-6 weeks to produce a buttery tenderness you can’t find anywhere else. The wet-aging process is carried out with the meat carefully packaged to prevent oxidation. These bags are then placed into coolers for wet aging before the beef is finally cut and packaged. This extra time allows the fibers of the meat to begin to break down and reach an extra level of tenderness. Because wet-aged beef isn't exposed to air, it doesn't lose as much moisture through evaporation; and the result is delicious, flavorful and tender meat. Treat your guests and yourself to a classy and delicious meal they will never forget.